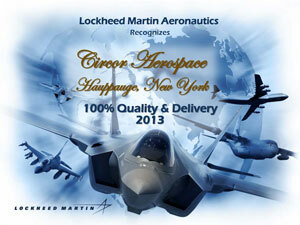 HAUPPAUGE, NY -- CIRCOR Aerospace, Inc., a CIRCOR International, Inc. company, was presented with the Lockheed Martin Aeronautics Award for 100% Quality & Delivery in 2013. CIRCOR Aerospace provides Lockheed Martin with pneumatic components on the F35 Lightning II fighter aircraft. "CIRCOR is honored to be recognized by Lockheed Martin as a top performing supplier they can rely upon to support the warfighter,” said CIRCOR Aerospace & Defense Group President Vincent Sandoval. “This award reflects the accomplishments that we have made through our Operational Excellence journey. Our team members made this award possible and we look forward to continuing to accelerate our progress toward exceeding customer expectations."